Violet Rossi is on the case! When some valuable van Gogh sketches are stolen from her father's newest clients, Violet joins the search in the hopes that she can help find the corresponding painting that the robbers are demanding before it's too late. When I first heard of Tokyo Heist, I just knew it was a book that I needed to get my hands on! 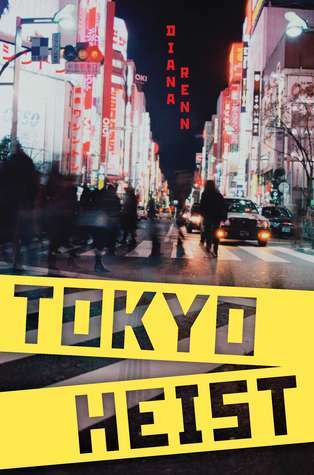 With its promise of featuring Japanese culture and even a few references to manga, I certainly enjoyed reading this book - but not as much as I thought I would. It is no secret that I'm fascinated by other places and cultures, and it just so happens that Japan is one of them. I love that the author managed to sprinkle in Japanese references and bits of manga and the whole visit to Japan - it definitely made me smile, as I loved reading about the culture! I gained a little bit more knowledge about Japanese culture, especially when it came to the arts. That was another thing I absolutely loved about this book. Art played a very important factor, both as the object of this little mystery, as a career for certain characters and even as a pastime (and possible career) for our main character, Violet. Any book that highlights the beauty, importance and even significance of art automatically hits a sweet spot with me, and this book did just that. The mystery itself is where I'm slightly hesitant to lavish praise. While it reminded me of Nancy Drew in some ways, I felt like everything about this mystery was just a tad too convenient. It didn't bother me as much as you'd think, but I knew from the start that Violet would be able to figure things out because of all these clues laid like breadcrumbs before her. Also, Violet is a character that I couldn't particularly connect well with. I did appreciate her love for manga and her desire to create one of her own, but apart from that, it felt like she was someone else entirely the whole time I was reading the story. As a strong fan of good characters, I always prefer characters who I can feel a personal connection to and sadly, Violet was not that for me, though she was perfectly likeable. This novel took me on a quick-paced, action-packed adventure. While the too conveniently solved mystery and a lack of connection to the main character made it fall short of my expectations, this book was still entertaining and quite fun to read. I really love finding books that integrate Asian cultural aspects, but this one was just average to me. It was just an average read for me, but I did like how quick a read it was! I had a lot of fun reading this book but I wish it had featured some artwork from the manga-that would have added a lot to my enjoyment. YES. That would have been absolutely PERFECT. I love that thought! Sounds like a light, fast-pace read. I think I'll pass on this one though because I would like to be able to connect with the characters. Great review though! I like the fact that we get to know the culture and places. Yes, it was really hard to connect to Violet. But still, it was quick and enjoyable!